During the past few decades, there has been intense discussion as to which forestry practices should be used in the western parts of Vilhelmina Municipality. Conflict over how to manage the Blaikfjället and Njakafjäll areas specifically received substantial public interest during the 1980s and 1990s. The main land-owner, Vilhelmina Municipality, had planned harvesting operations in the old-growth forests of Njakafjäll, but these operations were strongly opposed by environmental organizations. In the end, both areas became nature reserves. Dominating discussions today are issues related to environmental sustainability and land access rights for indigenous migrant reindeer herders vis-à-vis forest practices. Environmental adaptation of hydro power production in the catchment area of the river Ångermanälven is the main focus of practical work in the Model Forest landscape. The land-base in Vilhelmina is in the transition area from boreal to alpine zones. The area is a typical coniferous-dominated landscape of inland northern Sweden. It is variable in its topography, from about 340 meters above sea level up to 1000 meters. There is a great variety of natural habitats and degree of disturbance by forestry. Some 350,000 hectares are productive forestland, dominated by mature forests (80 years or more). The amount of old forests increases going westward, as does the proportion of forests with high natural values. The most common tree species are spruce, pine and birch. About half of the people who live in Vilhelmina municipality own some forest property. Around 100 Sami people are organized in indigenous reindeer herding communities. Forestry is an important component of Vilhelmina’s economy. More than 100 people are employed as truck drivers or have other forestry-related occupations. For the informal economy and cultural heritage of the community, as well as for the well-being of the citizens, the forest is of vital importance for supporting hunting, berry picking, fishing and recreational activities. 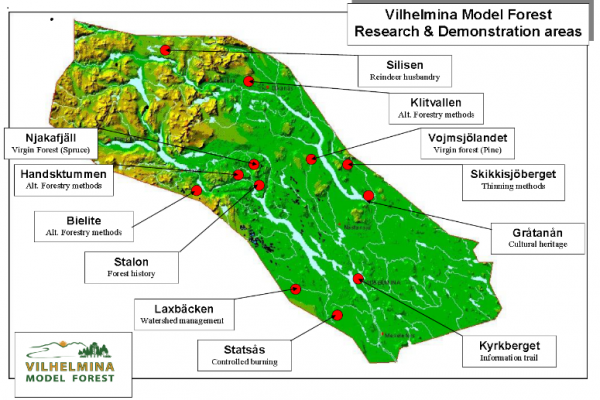 Vilhelmina municipality is the head organization of the Model Forest. Representatives from organizations engaged in water related issues. To increase exchanges with other Model Forests and similar initiatives, both nationally and internationally. Release of a periodic newsletter to share knowledge, lessons learned and information about ongoing work. Within the projects, collaborations were developed on different topics and between different actors such as researchers, Vilhelmina municipality, NGO’s and citizens. Co-operation between the municipality and researchers in the development of municipal comprehensive planning through an extended landscape perspective and an improved participation process. Award: Vilhelmina Model Forest received the Governor General´s Medallion.